MTC is collaborating with Putrajaya Corporation (PJC) on the construction of a glued laminated timber (glulam) pedestrian bridge as part of the Putrajaya City Trail project. PJC is a local authority administering the Malaysian Federal Territory of Putrajaya. The City Trail project’s main objective is to enhance Putrajaya’s wetlands as a tourist attraction. The glulam pedestrian bridge will be the first of its kind in Malaysia. Spanning 30 metres, the bridge will connect Putrajaya’s Precinct 1 to Precinct 16 as part of the City Trail project. The width of the bridge is three metres and it is estimated to take 18 months to complete, with a target completion date of August 2016. 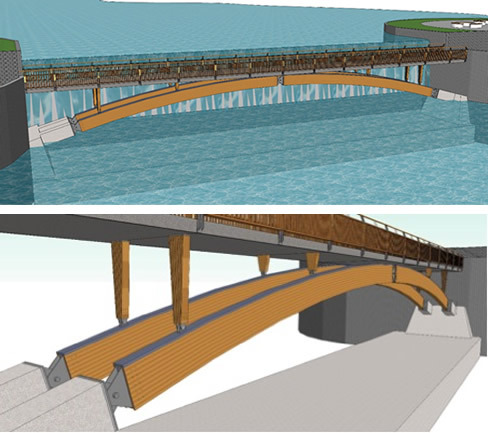 To ensure that the MTC-PJC glulam pedestrian bridge is technically safe and sound, MTC has also engaged a timber bridge expert, Rune Abrahansem from SWECO, Norway, as a third party assessor on the engineering details of the bridge. Abrahansem has been involved in building SWECO-consulted timber bridges, including the world’s strongest timber bridge for military loads in Norway, in 2005. Watch this space for further updates of the glulam pedestrian bridge.